The 2008 session of the General Assembly is now history. It wasn’t the best of years, but it was far from the worst of years. Working closely with other organizations, we were able to get several important bills passed which we expect Governor Rell will sign into law by the time you are reading this. Our major accomplishment this year was passage of the Face of Connecticut bill. This bill creates a fund for local and regional open space programs, farmland conservation and stewardship, affordable housing, revitalization of urban parks, historic preservation and clean up of contaminated properties. It encourages both the preservation of our rural lands and the redevelopment of our decaying industrial areas, thus reducing the demand for industrial sprawl. At first glance these programs appear to be quite diverse, but they all contribute to preserving our heritage and the quality of life in Connecticut as we know it. The Face of Connecticut program will be managed by a steering committee consisting of the Commissioner of Environmental Protection, the Commissioner of Agriculture, the Executive Director of the Commission on Culture and Tourism, the Secretary of Policy and Management and eight appointed members representing a state-wide nonprofit open space preservation organization, a local or regional nonprofit open space preservation organization, a water company actively involved in land preservation, a nonprofit farmland preservation organization, the agriculture industry, a state-wide nonprofit historic preservation organization, a local or regional historic preservation organization and a community development organization, thus bringing citizen participation directly into the program. Although no funds were appropriated for the Face of Connecticut program this year, this is not a major problem. Even if money was available now, the steering committee members would still have to be chosen and appointed and the committee get itself organized before it would be ready to move forward with any of the programs authorized in the bill. This all takes time, so most likely the General Assembly will be working on the 2009-2010 budget by the time the committee is ready to move forward with its programs. Some people have criticized the state’s farmland preservation program because it has done little to preserve small local farms. The Department of Agriculture’s response has been that it is trying to preserve large blocks of farmland that can be farmed efficiently and will have a small number of adjacent residential properties whose occupants might complain about the noise and odors of normal farm operations. The Face of Connecticut bill provides for a parallel program to the State’s existing farmland preservation program which will concentrate on smaller farms that are important locally. While there are no funds to start up this new program, the authorization is in place, an important first step in getting any new program up and running. Another important bill was passed to help the dairy farmers by promoting the use of milk and milk products. Like the Face of Connecticut bill, no money was appropriated for this milk promotion, but we at least have the legislation in place when the funds are available. 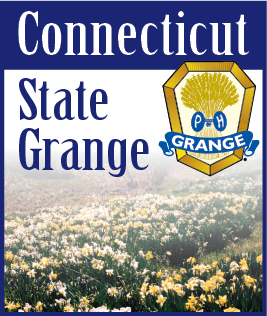 Two bills the Grange supported did not pass, mostly because they would have resulted in a net loss of tax revenues to the State. One bill would have allowed people to take a credit on their state income tax return for the value of land or easements donated for conservation purposes. The other would have exempted the donation of farmland preservation easements from the “look-back” period when a person applies for medicaid and similar programs. At the national level, the congressional conference committee reached a compromise on the 2007 farm bill which is expected to be approved by both the Senate and the House of Representatives by the end of May. (The House approved the bill as of this publication— it awaits Senate approval). The problem is that there are provisions in the bill which President Bush does not like and he is expected to veto the bill. The big question is whether or not there will be enough support in Congress to override the President’s veto. I won’t say Congress is slow, but I did not make a typographical error on the name of the bill. Here we are in the middle of 2008 and Congress is still working on the 2007 farm bill. The good news is that when the bill finally becomes law it will provide programs for several years.